Do you ever get the feeling we've become inundated with doomsday scenarios? That's probably because we are. Name the issue: it could be the environment, or the planet in general. It could be rapid population growth, or the decline of whales due to overfishing. Just name the issue and there will more than likely be facts, figures and infographics that illustrate just how dire the situation may be. Admittedly, there is a great deal of truth to these warnings, but there is one issue that is just as important as the ones mentioned, but yet it lingers under the human awareness radar and remains frustratingly low on the information noise meter. And the issue is bees. It's all about bees. Not wasps or hornets, but bumble bees, honey bees, worker bees - various varieties of bees, all under threat of extinction. And now that I've revealed the issue, I'm sure that I've lost my reader (ha). That's ok, I'm still going to write about this. A couple of years ago I visited Australia and did a tour of the Mornington Peninsula - a region close to Melbourne. The area is famous for its wine, weather and incredible scenery. My friend, Chef Jason Goldengay, was my guide and he took me to the farm where he keeps his bee hives. That wasn't officially part of the tour, but he asked if I wanted to see them and of course I said yes. I was dressed in the proper bee protection uniform, but I did not get too close to the hives (only because I couldn't climb the damn fence to get to them, which is different story for another time). We had a long chat about the importance of bees to his farm, a brief discussion about what's happening to bees worldwide and why the deaths of active bee hives will greatly effect the foods we eat and take for granted that will always be there. I have no idea how this happened, but the issue of saving the bees has really started to become a personal crusade for me. I mean we're talking about someone here who was very upset that the beehive growing inside my Mothers house walls last summer had to be destroyed - crazy eh? When I was obtaining my public relations certification, one of the projects I created was a "save the bees" campaign. I went all out, writing a media release, a brochure and a lengthy speech about the issue. Although initially the idea popped into my head strictly for school purposes, the more research I did on the subject, the more concerning it became for me. That concern grew to alarm after reading how changes in the way bees have been utilized for farming purposes are killing them. It opened my eyes to the way we, or should I accurately say - huge food conglomerates, are not only changing the way we eat, but changing the way food is grown. The outcome of these changes have not only meant an increase in obesity for human beings, but a decrease in numbers of the very insect - bees, that provides us with the ability to have a variety of food in the first place. It's been reported on the Mother Jones website, that scientists may have solved the mystery of why beekeepers worldwide are experiencing serious decline - called colony collapse, in the number of hives they maintain (see the article here). Scientists believe that it's due to an increase in pesticide use and radical changes in farming methods and crops that are killing our bees. This recent news, however, does not change the fact that beehive colony collapse continues to be an important and very life threatening issue not only for bees, beekeepers and farmers, but anyone who wants to continue to eat. 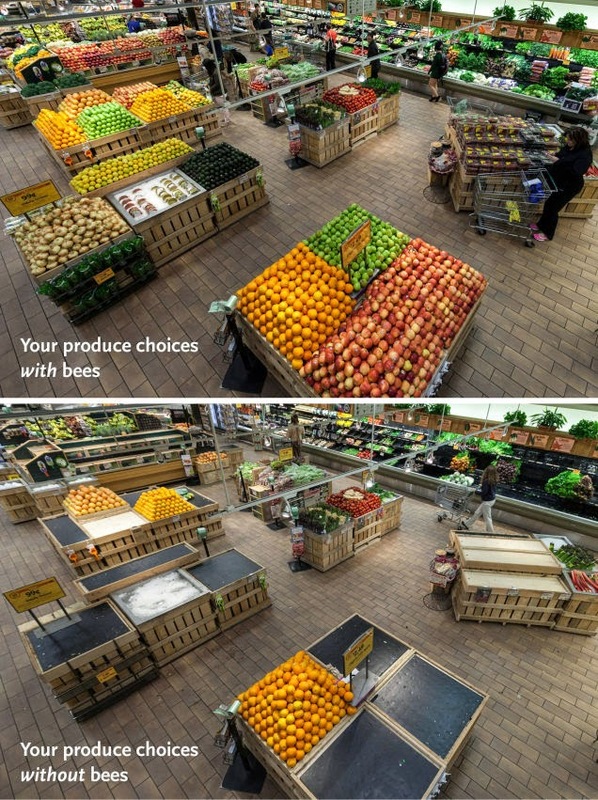 I think the picture at the start of the post explains everything in regards to just how important bees are to human nutrition. Scroll up and take a good look. 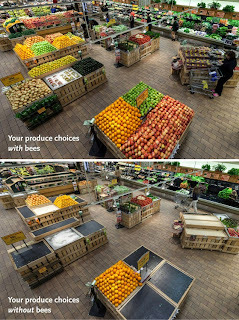 Bees are not just for providing human beings with delicious honey. It's mind-blowing how much we depend on bees for the pollination of flowers, plants, trees - the list is endless. When I take this issue into consideration from the viewpoint of how badly I'd like to have a voice in the food industry, I can't help but be of two minds in regards to my career pursuit. On the one hand, I want to use the skills I've accrued over the years to become part of a incredible , dynamic sector. Yet, I also know that becoming a part of that sector, means accepting that I will also play a part in an industry that continues to create products resulting in serious health and environmental implications for humans, animals and general life on this planet. As with any issue, being informed means listening to both sides of the story. It's understood that profits are a benefit to a company in order to stay competitive and afloat. It pays the salaries of workers. It pays for the research and development to improve the foods we eat. For the food industry, increased profits could also mean an increase in food security for people around the world. That's what we are told, and for the most part believe. The methods used to increase profits in the food industry, however, has become increasingly responsible not only for the destruction and decimation of insects, wildflife and the environment, but to us - humans who were supposed to benefit from these "advancements". It's horrible to see see what carelessness and the pursuit of the alimighty dollar can lead to, yet it's a tired cliche. We know what this can lead to, yet it's a lesson we just never seem to learn. And with the continued loss of the one thing that truly sustains us and our ability to produce the food we desire, we are still messing around with nature, all in the name of "creativity". I could go on forever about the plight of the bees, but I'll stop here. If you do care to know more about this issue, please visit this site. And please note that I am not affiliated in any way with this or any bee-related site. I just want to do my part in raising awareness.